A decade ago, the Sloan Kettering Institute embarked on an effort to broaden and streamline its research activities. A decade ago, the Sloan Kettering Institute embarked on the largest effort to broaden and streamline its research activities in its 65-year-long history. Now the investment has put Memorial Sloan Kettering in a unique position to make discoveries that will further scientists’ understanding of human disease, especially cancer — and to harvest the ripest fruits of such discoveries through investigation aimed at benefiting tomorrow’s patients. According to Sloan Kettering Institute Director Thomas J. Kelly, the expansion and reorganization has been a massive undertaking, which within the next five years is expected to yield an enterprise with about twice the research space it had when Dr. Kelly joined Memorial Sloan Kettering, in early 2002 (see the chart below). Research Space — *Upon completion of the second ZRC building which is in the final stages of construction. “The goal of this effort is twofold,” he noted. “First, to build on the institute’s traditional strengths by allowing its basic science program to grow. And second, to enhance opportunities for translational research,” the type of investigation that integrates knowledge gained in laboratories and clinics, with the goal of developing new strategies to control or cure disease, or reduce people’s risk of developing diseases in the first place. Advances through research are made only by the creative genius of individual scientists. Progress in science and technology also laid the groundwork for exploring therapies that attack cancer in innovative ways — for instance, using genetically engineered white blood cells that can detect and kill tumor cells, or drugs designed to improve the precision of radiation therapy. Craig B. Thompson, who served his first day as Memorial Sloan Kettering President on November 2, 2010, noted that research performed in Memorial Sloan Kettering laboratories has contributed many of the past decade’s transformative developments. “In the coming years, we will continue to strengthen the bridges between our laboratory and clinical scientists to fully realize the potential of all the extraordinary research that goes on here,” he said. Dr. Kelly added that this decade will be “a golden era for clinical discovery” at Memorial Sloan Kettering, as both knowledge and research infrastructures are now in place to develop new therapies that are effective and safe, and that can be tailored to give maximum benefit for each patient. 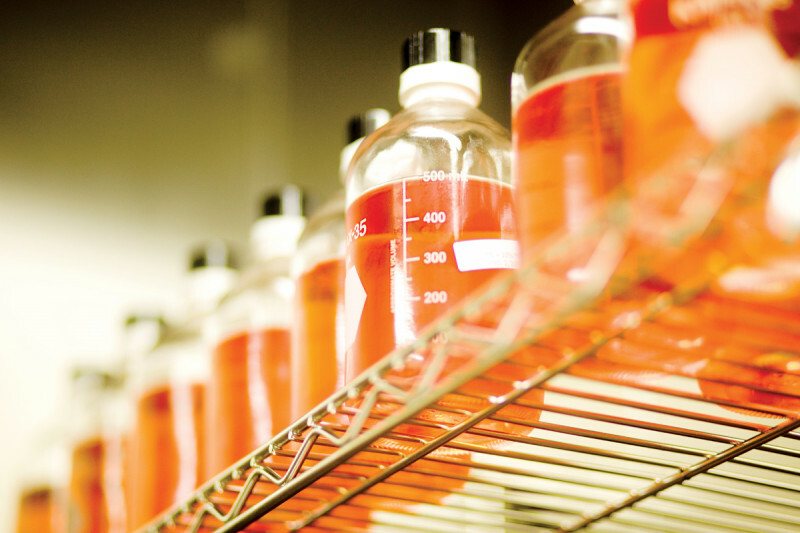 Since 2000, more than 50 new research labs have been started at the Sloan Kettering Institute, some of which populated four newly established research programs (see Milestones 2000 to 2010), while others extended the scientific agenda of already-existing programs — in cell biology, molecular biology, immunology, and molecular pharmacology and chemistry. Sloan Kettering Institute has always had an exceptionally vibrant research community, renowned for its excellence in science. Today this community spans the entire discovery continuum — from the researchers who uncover the most basic cornerstones of life to those who realize the clinical potential of such findings — with creative interactions and collaborations taking place across the board. At the Sloan Kettering Institute, new lead investigators are chosen with great care, Dr. Kelly said, because each recruit is regarded as a long-term commitment on the institute’s part. “I see it as my main job to safeguard the high quality of our science by making sure we get the very best people to join us — and then to support their work and careers as well as we possibly can,” he said. And the Sloan Kettering Institute does attract many of the “very best people.” A substantial number of the institute’s approximately 60 senior members have been honored with the most prestigious awards bestowed on biomedical scientists in the United States. For example, 11 are members of the National Academy of Sciences (NAS), six are Howard Hughes Medical Institute (HHMI) investigators, and 13 are members of the Institute of Medicine (IOM). I'm excited to be working among people who are at the top of their fields. It's gratifying to know that you can always go knock on their doors and they're there for you. Other prominent researchers joined the institute as junior investigators and have successfully advanced their careers at Sloan Kettering Institute. Laboratory scientist Scott N. Keeney, who established his own laboratory in 1997 when he joined the Molecular Biology Program, is today a Sloan Kettering Institute Member (a designation the institute bestows on senior faculty) and an HHMI investigator. Dr. Keeney’s research has shed light on the basic mechanisms cells use to repair ruptures in their DNA. These studies suggest that similar repair mechanisms allow cancer cells to survive the DNA damage induced by etoposide, a commonly used chemotherapy drug. This survival could contribute to a patient’s cancer becoming resistant to the drug. “Our discovery might enable the design of more-effective anticancer therapies,” Dr. Keeney noted. According to laboratory researcher Alan Hall, who chairs the Cell Biology Program, one resource that sets Memorial Sloan Kettering apart from other research centers is the Sloan Kettering Institute’s 36 core facilities, which provide a wide range of expert services and research technology. Elisa de Stanchina heads the Sloan Kettering Institute’s Antitumor Assessment core facility. Over the course of the past ten years, research support has been augmented to accommodate the Sloan Kettering Institute’s growing scientific community and to maintain technologies at the leading edge. Some new services were introduced — notably, facilities dedicated to the development of small molecules for cancer therapy — while many existing facilities were expanded, both in the numbers of people who serve on their staffs, and in their laboratory spaces, equipment, and technology. Laboratory scientist Andrea Ventura, of the Sloan Kettering Institute’s Cancer Biology and Genetics Program, said strong research support is a key to success for a start-up lab such as his, which he launched two years ago. The lab explores how molecules called microRNAs act on genes to either promote or halt cancer progression, with the ultimate goal of exploiting these molecules for therapy. “We have already generated eight transgenic mouse strains that lack individual microRNAs, and we are now in the process of analyzing them,” he noted, adding he could “only have dreamt of doing such experiments” without the support of Sloan Kettering Institute’s Antitumor Assessment and Mouse Genetics facilities and its Genomics Core Laboratory. “From the first day I walked in [in 1996], I knew this was a place where people love to interact and share ideas about science,” said Dr. Anderson. Much has happened at the Sloan Kettering Institute since that day. With the addition of new laboratories and programs, many areas in which the institute’s investigators traditionally excelled — such as developmental biology, molecular genetics, and structural biology — have been strengthened, and programs incorporating newer disciplines such as computational biology have been established. Opportunities have also grown for basic scientists to see their work translated into clinical applications, or to actively take part in this endeavor. When Dr. Anderson began her research career by investigating the cellular mechanisms that guide a fruit fly’s development, the relevance of those mechanisms for human disease was “still somewhat theoretical,” she said, but that relevance has now become more obvious. Research findings made in several Sloan Kettering Institute laboratories — including Dr. Anderson’s lab, which currently investigates the genes that control development in a mouse embryo — have shed light on the cellular processes that allow normal tissues to take shape and grow. These processes can also be co-opted by tumors. Federal Research Awards Granted to the Sloan Kettering Institute — Sums include all federal research expenditures on awards made directly to the Sloan Kettering Institute, excluding awards made to another institution and subcontracted to the Sloan Kettering Institute. For example, researchers in the lab of Alan Hall, Chair of the Cell Biology Program, are investigating a group of proteins called Rho, which dictate how normal cells divide and move around within a tissue. When inappropriately activated in tumors, these proteins can promote cancer progression and metastasis. Scott Keeney with research fellow Liisa Kauppi, who is pursuing her postdoctoral training in his lab. Research in Dr. Allison’s laboratory is focused on the molecular mechanisms by which the immune system’s T cells can be activated to defend the body against challenges such as cancer or infections. In the 1990s, Dr. Allison discovered that a protein called CTLA-4 inhibits T cell activation and can act as a brake on T cells’ ability to track down and kill tumor cells. He later worked with a team of Memorial Sloan Kettering clinicians — led by medical oncologist Jedd D. Wolchok — and with a biotechnology company to develop an antibody therapy that releases this brake by interfering with CTLA-4. The drug, ipilimumab, is the first success in a series of efforts to develop treatments that act by enhancing the immune system’s inherent ability to recognize and attack cancerous cells. Today thousands of people have been treated with the drug, which holds high promise for the treatment of several cancer types. In June, ipilimumab was shown to be the first therapy to improve survival in patients with advanced melanoma — and the estimated survival benefit to patients receiving the drug was remarkable, with a 25 percent survival rate four years after treatment. Dr. Allison and colleagues are now investigating — in mice — what he and many others believe will be the next generation of cancer therapy: treatments that combine immune therapy, such as ipilimumab, with drugs targeting specific genes or proteins that drive cancer progression. In addition, the investigators continue to explore the molecular fundamentals that make T cells able to defend the body from foreign intruders, hoping their research will instigate innovation in cancer therapies. “Until we’ve objectively improved our understanding of how T cells are regulated, we won’t find new or better ways to manipulate them in the clinic,” Dr. Allison noted, adding that this approach once led to the discovery of CTLA-4, the protein that ipilimumab targets. “Had I set out to search for a molecule we could manipulate to trigger a patient’s immune response against a tumor, I would never have found it,” he affirmed. The postdocs and students who train in our labs are those who generate the most creative ideas, and their success is the center of our academic mission. Currently more than 400 postdoctoral researchers are working in Sloan Kettering Institute labs, which amounts to half of the institute’s academic community. As part of the Sloan Kettering Institute’s recent expansion, several efforts have been introduced to support postdocs in their training, and to help them secure future employment — whether as scientists in academia or the biotechnology industry, or as research professionals pursuing alternative career paths. Dr. Keeney and many of his faculty colleagues meet with the institute’s research trainees on a regular basis to share their experiences and to discuss various career challenges. This forum is part of an extensive career development program offering a host of services — from writing workshops to networking events. In addition, the Sloan Kettering Institute recently implemented new mentoring guidelines to foster stronger relationships between postdocs and their faculty advisors. But academic training, education, and mentoring is a long-established mission of Memorial Sloan Kettering. Together with their colleagues at the Weill Cornell Medical College (WCMC), Sloan Kettering Institute faculty have engaged in graduate training since 1952. In the past decade, the number of graduate students training at the Sloan Kettering Institute has more than doubled (see chart below), with the addition of several graduate training programs — including one in Computational Biology and Medicine, offered jointly by Memorial Sloan Kettering, WCMC, and Cornell University; and one in Chemical Biology, a collaboration between Memorial Sloan Kettering, WCMC, and The Rockefeller University. And six years ago, when Memorial Sloan Kettering obtained degree-granting status from New York State for the first time, the Center launched a PhD program of its own, the Gerstner Sloan Kettering (GSK) Graduate School of Biomedical Sciences.